I am a professional knitting teacher providing classes in various locations in London. I teach all levels and am particularly experienced with beginners. Location of classes varies around London. If you would like to learn to knit or improve your knitting please contact me. 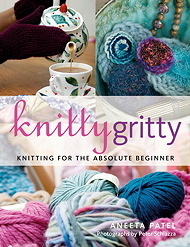 I have also written a best selling knitting book called Knitty Gritty - Knitting for the Absolute Beginner and a sequel, Knitty Gritty - The Next Steps. Keep in touch by subscribing to my mailing list on the right, liking the Knitting SOS facebook page and following me on twitter. ...and get a FREE Look Mum No Hands cycling cap! It's knitting, but not as you know it! Knit Today magazine - New Feature! Here's a teaser knitting pattern from Knitty Gritty - The Next Steps! Latest news about my upcoming book! Save the Children needs you! Knitting SOS on BBC Breakfast! Watch Aneeta talking knitting to the nation. Getting in contact with Aneeta in the next few weeks..
...let me know if you can spot the difference. Knitty Grittier (working title) now in the works! I've started writing the sequel to Knitty Gritty!!! 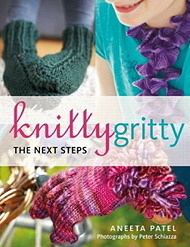 Knitty Gritty back in print! 6000 copies sold! 3000 more to come soon. Have you emailed me and not had a reply? I deleted your email by mistake as it went to my junk mail! Judged by your very own Aneeta Patel of Knitting SOS! Pick up your knitting to keep you warm this Autumn! New Free Summer Knitting Pattern! Drop me a line. I might be able to help! Lovely article promoting all things SOS! Knitty Gritty is Numero Uno! My first book review on Amazon! Please feel free to write your own (positive hopefully!) reviews of Knitty Gritty and I'll put them on this web page.